Baykeeper recommends that cities use natural elements (known as “green infrastructure”) wherever possible to adapt to flooding and rising tides. For example, we advocate for restoring and rebuilding wetlands, which serve as natural buffers against the impact of storm surges and sea level rise along Bay shorelines. However, much of San Francisco’s downtown waterfront was built on what was formerly Bay waters. In this case, a fortified seawall is the only viable way to protect $100 billion worth of property and infrastructure, including roads, piers, sewer lines, and businesses. 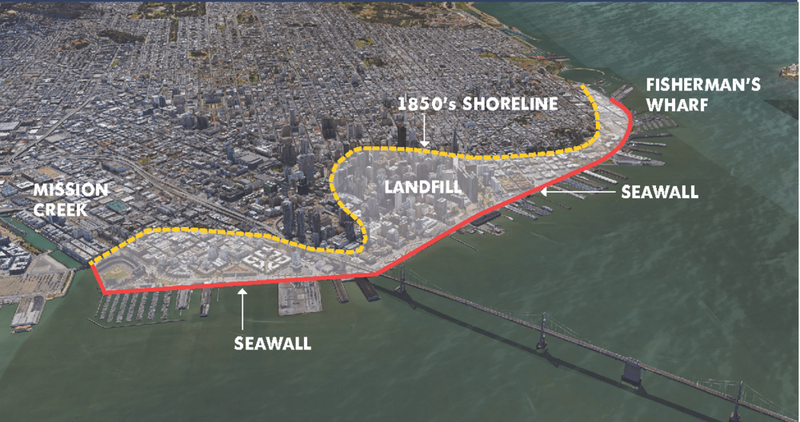 A major earthquake, sea level rise, and storm surges risk the integrity of the seawall and could render BART and Muni inoperable for weeks or months. Prop A would authorize $425 million in bonds to pay for repairs and upgrades to the Embarcadero seawall. Baykeeper urges San Francisco voters to say yes to Proposition A on election day, November 6. In addition to the San Francisco Embarcadero, there are a number of other locations around the Bay that are vulnerable to sea level rise. Baykeeper has added imagery of over 200 miles of the San Francisco Bay shoreline to Google Street View and investigated the Bay’s vulnerabilities. Now we are making recommendations to local agencies and city planners to protect sensitive areas along the Bay’s shoreline, using natural solutions whenever possible. Learn more on our ShoreView website.